Alex MacDonald has experienced promotion from League Two before. Alex MacDonald says he is seeing similarities between the team spirit at Mansfield Town and that at his former club Oxford United when they won promotion. MacDonald was promoted from League Two with United back in 2016, so knows full well what it takes to make the jump to League One. And now, as he aims to help mastermind the Stags on a similar journey, he believes the ingredients are there and that the pressure the players are under is a positive thing. “That’s a pressure you don’t want to be under, where the club’s on a downward spiral and trying to avoid going out of the Football League. It’s really tough. “It was an experience that held me in good stead for the rest of my career in terms of trying to avoid being involved in something like that again. 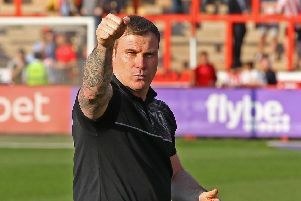 He said: "The manager had a lot of meetings with the lads last week and the whole week just seemed right and galvanised the spirit and it certainly showed in the performance at Exeter on Saturday which was a very, very good away display. “In the meetings, the manager just reminded us why we do our jobs and he gave us the chance to tell our stories and talk about why and for whom we do our jobs. “A lot of lads really opened up and committed to it and carried that on at Exeter. “From my point of view, my little girl is a huge motivation for me and I want to try and give her and my partner the best life I possibly can. I’m very success-driven and have been lucky in my career to achieve promotions and it’s something I love doing as it sets you up for the summer and you can reflect on it." With Cambridge United the visitors on Saturday, MacDonald now wants to see the momentum gained from last Saturday's win continue. He said: "You’ve got to try and hit form at the right times of the season. We’ve got some really tough games coming up but they’re ones we’re looking forward to and ones that if we turn up and apply ourselves in like we did at Exeter then I’m fully confident we’ll win.